NINE INCH NAILS T-Shirts which we offer at Plain-t-shirts.co.uk forms part of our movie, games and music official merchandise range. 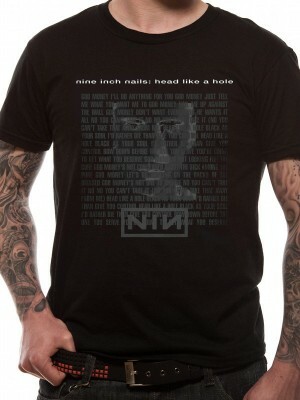 NINE INCH NAILS range we offer fast delivery all over UK/EU NINE INCH NAILS - HEAD (UNISEX) which we offer which you .. Despite this, the band has had several feuds with the corporate side of the recording industry. In 2007, after the release of their fifth studio album Year Zero (2007), these entanglements resulted in Reznor announcing that the band would split from its longtime record label Interscope Records to release future material independently, before signing with Columbia Records for the release of their eighth album Hesitation Marks (2013). Reznor returned to self-releasing material with the second Nine Inch Nails EP, Not the Actual Events (2016). As the band's main producer, singer, songwriter, and instrumentalist, Reznor was considered the only constant member and creative force within the group through much of its history. However, this changed in 2016 when Atticus Ross was introduced as a permanent member of Nine Inch Nails, alongside the announcement of the Not the Actual Events EP. Furthermore, Reznor typically assembles a live band to perform with him onstage. These touring bands feature a revolving lineup, and often rearrange songs to fit a live setting. Nine Inch Nails often employs thematic visual elements to accompany on stage performances as well, which frequently include light shows.